Challenge #12: Write a letter to a childhood hero (real or fictional). May I call you Al? I’ve been challenged to write a letter to my childhood hero. Immediately I thought of you. For almost a quarter of a century your charm and wit have helped me through many dark times. Each and every one of your songs brings an almost indecently wide smile to my face, and most of them make me laugh so hard that I cry! Your childlike nature is contagious and reminds me to enjoy life. Ever since I fell in love with your music as a child (and learned that mashed potatoes can be my friend) I’ve been better equipped to deal with life’s challenges. I’m not ashamed to admit that often on a sad day I’d pop “Alapalooza” in my cassette player and act out my own music video of “Jurassic Park.” My stuffed animals were fantastic audiences, and I always felt better after. And though I feel I may have lost a few brain cells while watching “UHF”, it was worth it! To this day, spatulas make me laugh. No joke! Even now your songs are a great part of my life. A few of them (including “Grapefruit Diet”) are on my iPod’s running mix. “I’ll Be Mellow When I’m Dead” is also on there. As I jog down the road I laugh every time you sing the line “I don’t really like to jog!” Anytime I’m in the check out line at a grocery store, I immediately begin singing “Midnight Star” (usually just in my head). And it never ceases to amaze me how many times someone will bring up a song and ask me if I know it and I say, “Well, I know the ‘Weird’ Al version!” And more often than not, your versions are way better. Anyway, what this all boils down to is that I just want to thank you for all your years of song and laughter. Though it’s been fun, I’m certain it also means a lot of hard work for you. You are extremely talented, using your gifts to touch the lives of so many people. Thank you so much for your dedication. Your songs are timeless and will be with me always. I’m going to send this letter this weekend and I’m super excited about it! The last fan letter I wrote was to John Stamos back when “Full House” was brand new. My second childhood hero is my bff Dawn. I’ve written a letter that is included in her (really late) birthday package, but I’m not going to include it here. It’s a little too personal, but I will say this: Anyone who is lucky enough to have a friend who is even half the person Dawn is truly has much to be grateful for and has the best reason to smile. Dawn, thanks for introducing me to “Weird” Al’s music, for forgiving me when I knocked you on the head with a giant Cheez Balls can, for “Newsies”, for getting me through high school, for your children, for New York City, for never giving up on me. And for not being mad at me for blogging about you and including a picture without your permission 😉 I. Love. You! Posted in Mental Health, Uncategorized and tagged adultitis, humor, mental health, wellness. Bookmark the permalink. So you were able to find the snail-mail address carefully hidden somewhere on Al’s website? Good eye! The processing of his fanmail is fairly glacial, but eventually he will get your letter, and he will read it, and he will be happy to know that his work has been such a positive part of your life. He really does care about his fans. I forgot to thank you for your comment, Helen! I actually didn’t find the address until you mentioned it! I was just going to randomly email it and see what happened, if anything. But after reading your comment I scoured Weird Al’s website until I found the snail-mail address!!! Thank you so much for commenting!!!! 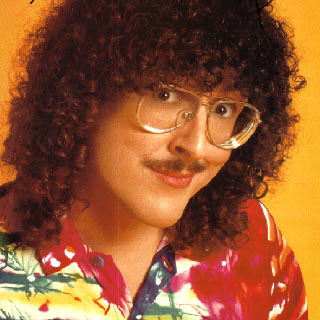 So you and Dawn and Weird Al fans too? Awesome! The man is a serious idol of mine. I mean really how can one guy write so many outrageously funny songs? I first heard his Beat It parody “Eat It” and of course his silly “Like a Surgeon”. I was hooked. I love listening to him at work when I’m stressed – he just cracks me up. P.S. You’re doing a great job escaping adulthood! Keep it up!